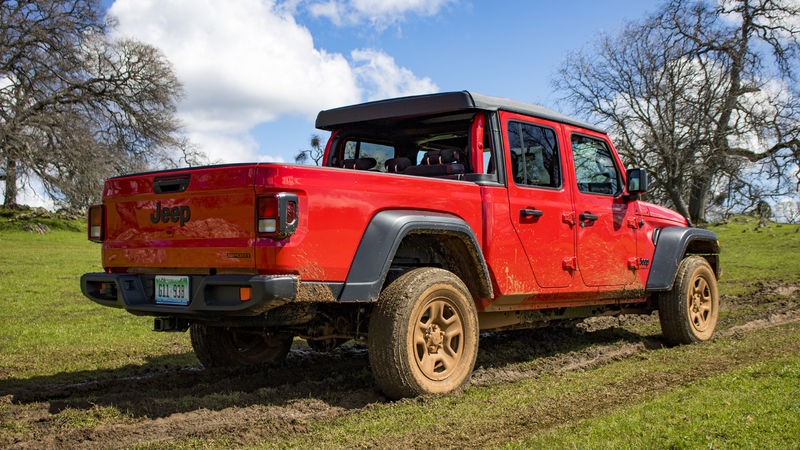 The Jeep pickup-shaped hole in the automotive market, patched by the enterprising aftermarket for decades, is now properly filled by a bonafide Jeep pickup: the 2020 Jeep Gladiator. Rolling into the suddenly-hot arena of midsize trucks like the happy warrior it is, the JL Wrangler-based Gladiator benefits from an iconic, scrawled in stone design, the off-road chops of its seven-slot cousins, and pickup powers drawn from the Ram 1500. There's a lot riding in the bed—and as with any highly-anticipated model, a lot of chances for the company to screw it all up. Thankfully, that didn't happen. 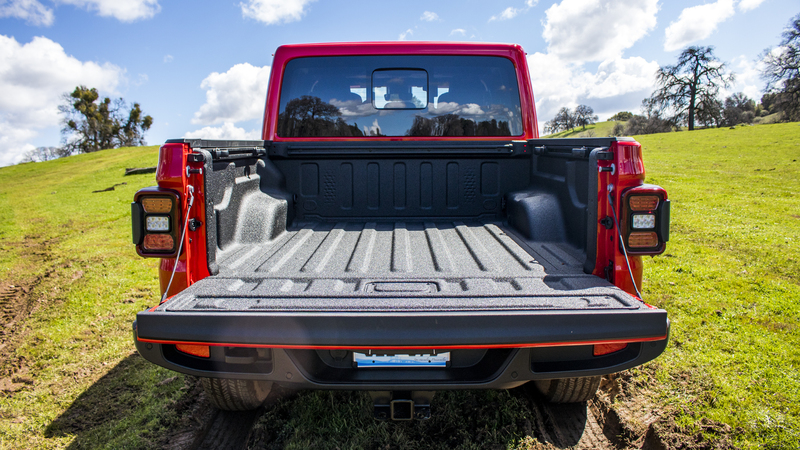 The 2020 Jeep Gladiator is instead a damn good truck as viewed from the perspective of both traditional pickup buyers and Jeep diehards. It comes down to the balance struck between the Wrangler's archaic nature and the demands of adapting the platform for a pickup, with just the right amount of both DNA sources preserved. In a practical sense, that means the Gladiator's Ram 1500 underpinnings help it achieve best-in-class tow ratings and drive better than a truck on solid axles should. It also means the Gladiator in turn gave up such a small percentage of its off-road capabilities compared to the Wrangler that 9.5 out of 10 buyers will never notice. 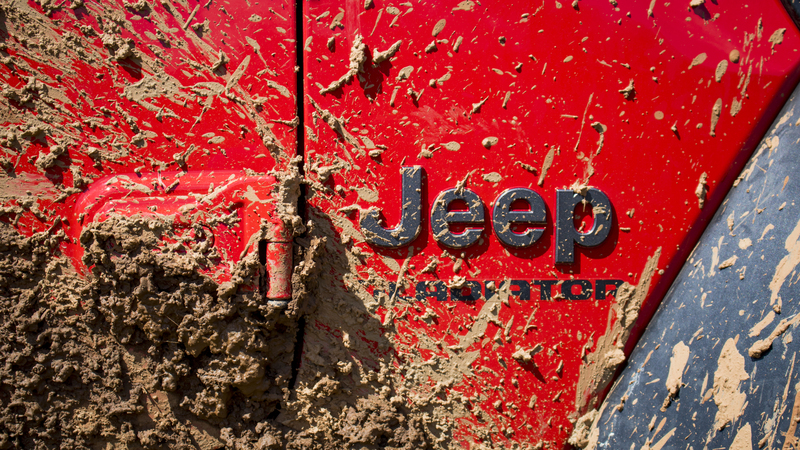 But being a Wrangler pickup means more than just towing a boat through a rock crawl course. The Jeep Wrangler is a special, one-of-a-kind vehicle, between its removable roof and doors and its fold-down windshield. The 2020 Jeep Gladiator had to retain all that essential Jeepness and then some. 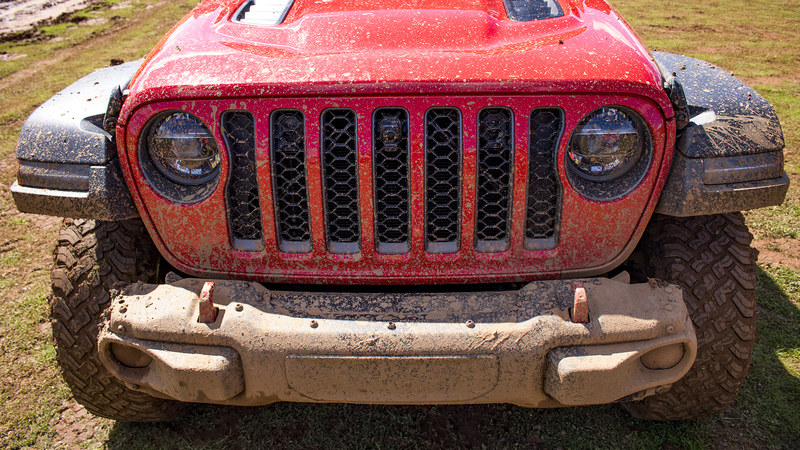 An extended test period will be needed to fully evaluate how Jeep succeeded here. But even eight hours in the driver's seat last week showed why the Gladiator is the most interesting truck on sale today—and maybe one of the best. Much as the truck's "Wrangler-with-a-bed" image shines through in its design, there are a large number of engineering changes under that blocky metal skin designed to give the 2020 Jeep Gladiator just as much (and in a few cases, more) capability as the midsize pickup standard bearers today. It starts with a new steel frame, 30.6 inches longer than the four-door Jeep Wrangler Unlimited, which results in a 137.3-inch wheelbase—nearly two feet longer than the Wrangler. 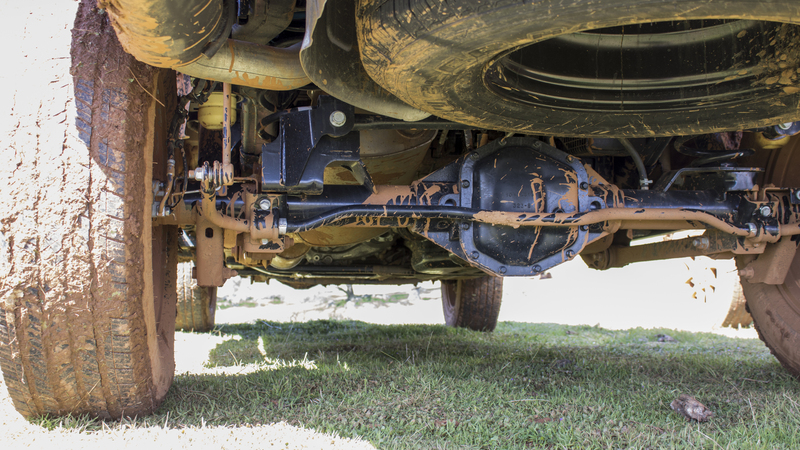 The solid Dana 44 axles front and back remain; while the Gladiator's coil-spring suspension up front is also ported over from the SUV, its rear-end setup is a custom five-link design adapted from the Ram 1500 with upgraded parts and progressive-rate springs. What does all that mean exactly? In terms of the Gladiator's abilities, all that work (plus wider grille openings for cooling) results in a best-in-class tow rating of 7,650 pounds, 150 more than the Ford Ranger. It's 1,600-pound payload capacity is also very competitive, and it shows that Jeep endeavored to make sure the Gladiator could be used as a functional implement like any other work truck. With the Wrangler's image as a lifestyle purchase, a pickup version needn't do more than complete the look to sell a few hundred thousand. But not only is the Jeep Gladiator a real truck, it's a damn capable one, too. The longer wheelbase and new rear suspension also contribute to a noticeably settled ride. Set aside the solid axles and archaic recirculating-ball steering—you're not carving corners in this thing anyway—and it's shockingly composed over bumps that would prompt a white-knuckle moment in either SUV. The difference is accentuated by the fact that you're sitting in an identical cabin looking out over an identical square hood. 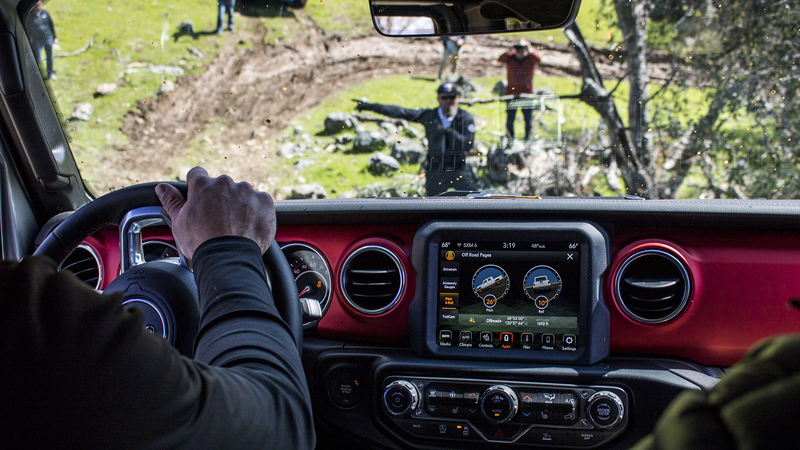 You'd swear it was the smoothest-driving Wrangler, until you looked in the rear view mirror. 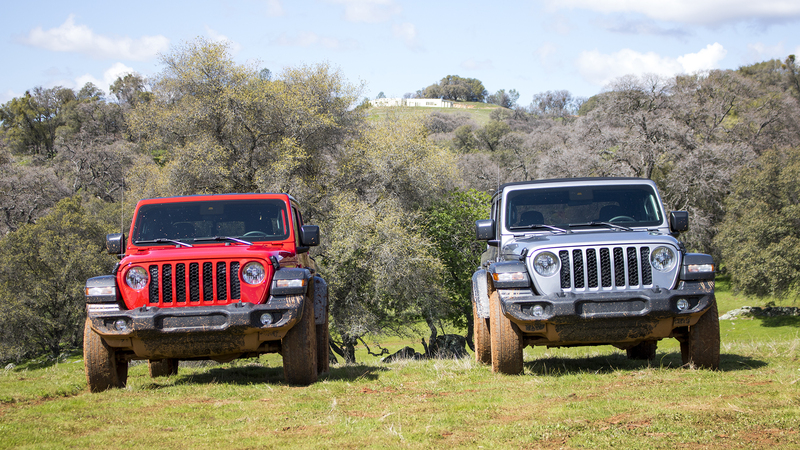 A few more key differentiators complete the Jeep's transformation to midsize contender. 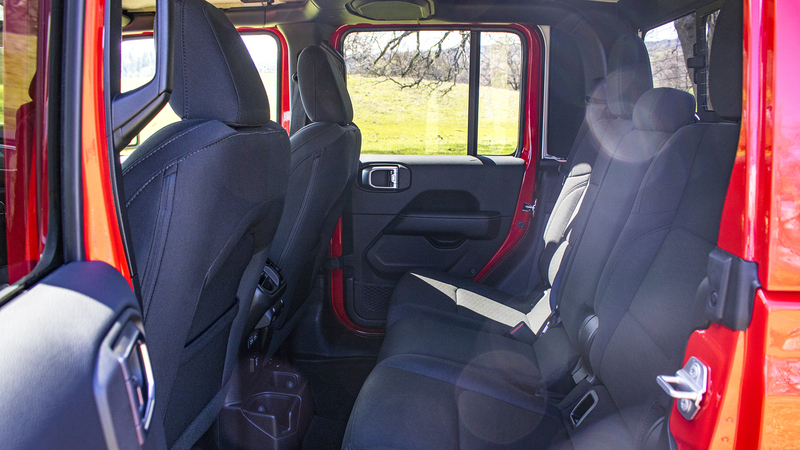 It only comes in crew cab configuration, a bummer to purists, but that long wheelbase also delivers best-in-class rear-seat legroom at 38 inches. At 73.8 inches, it's also narrower than every other pickup except the Nissan Titan and feels eminently more manageable to park. 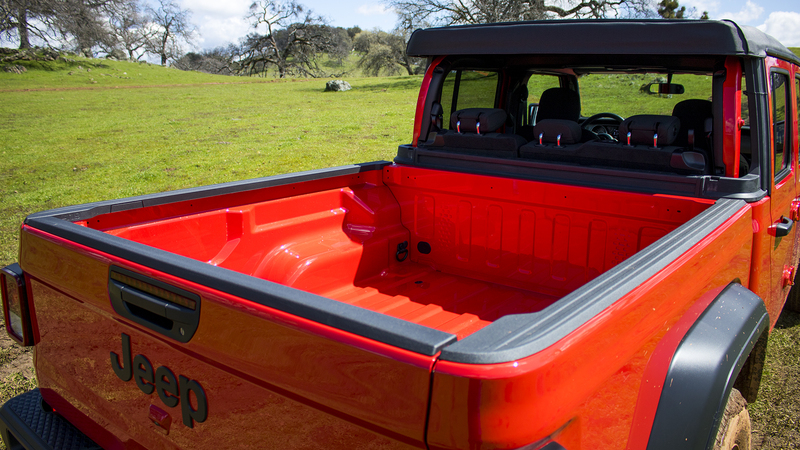 Out back, a smart roll-up canvas tonneau cover matches the Gladiator's throwback ethos perfectly and looks better than any other manufacturer's factory bed cover. And of course, the Jeep Gladiator is the only convertible pickup truck you can buy. Both the hard and soft tops can be ditched entirely to put nothing but the rollbars between you and the great blue yonder. And lose the doors while you're at it. Oh, what a feeling. So Fiat-Chrysler went above in beyond in making sure the 2020 Jeep Gladiator wasn't "just" a Wrangler with a bed, outward appearances aside. But the one area where engineers obviously couldn't compromise is the brand's central tenant: off-road capability. This isn't like slapping the famous grille on a lifted jellybean like the Jeep Compass and letting it flail around a bit. The Gladiator had to be able to do everything the Wrangler could—scramble over rock piles, Billy-goat its way over mountains, and generally provide that narcotic feeling of unstoppable power truck buyers crave. Its Rubicon trim needed to be able to handle the Rubicon Trail. Once again, they've done it. Sport and Overland trims are packaged with Jeep's Command-Trac 4WD system, a 2.72:1 low-range ratio, 31 inch tires, and skid plates. A limited-slip Trac-Lok rear differential is optional. 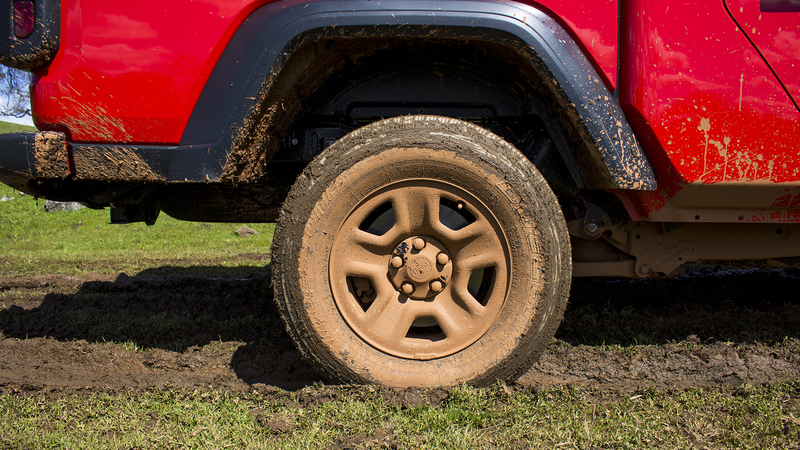 The 10 inches of ground clearance don't hurt, and neither does the best approach angle in the business. Breakover and departure are another story, as you might expect for a stretched wheelbase and a pickup bed overhang. 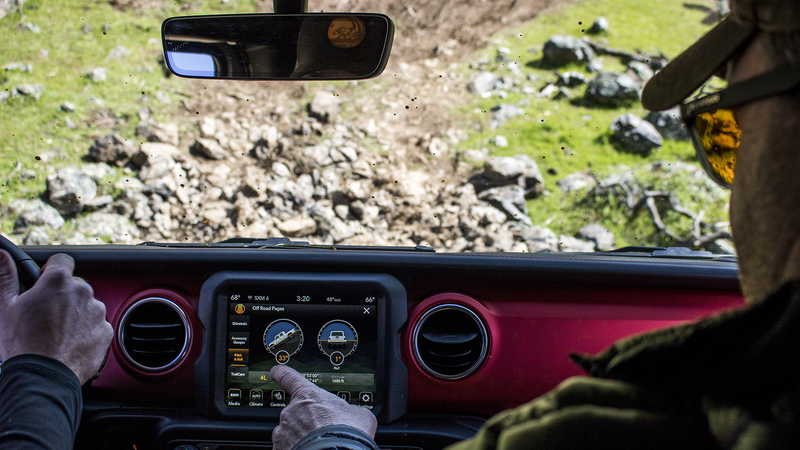 But in practice you're probably only losing 5-10 percent of the Wrangler Unlimited's off-road abilities, which are outside the abilities of an inverse proportion of drivers anyway. And that still leaves the Jeep Gladiator head and shoulders above every other truck. 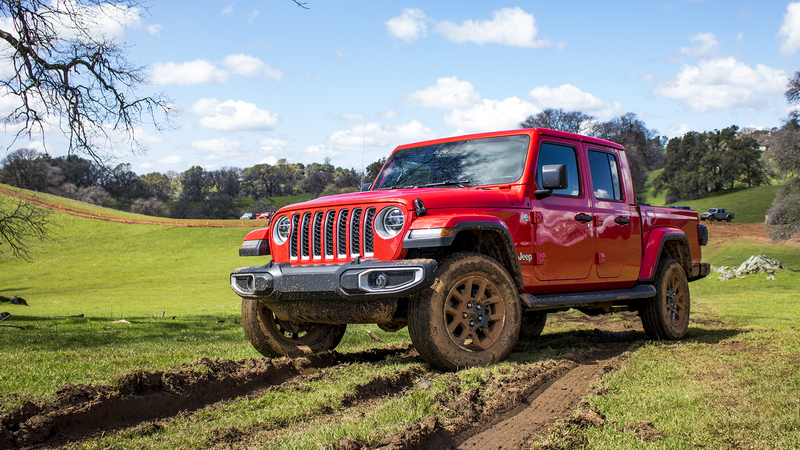 But the 2020 Jeep Gladiator Rubicon is the real star here, bringing everything that's made the JL Wrangler Rubicon such a hit to create the hands-down off-road king of pickups. Its Rock-Trak 4WD system, two-inch lift, Fox monotube shocks, rock rails, removable steel bumper, locking front and rear 4.10:1 axles, and optional 33-inch Falken Wildpeak Mud Terrain tires are a witch's brew of dirty fun. Just to get a little more nerdy, the transfer case and axles combine for an insane first-gear crawl ratio of 84.1:1 in the manual transmission, which is further aided by the flat torque curve of the 3.6-liter Pentastar V-6. All you have to do is pop it in first and the Jeep truck will climb a wall. 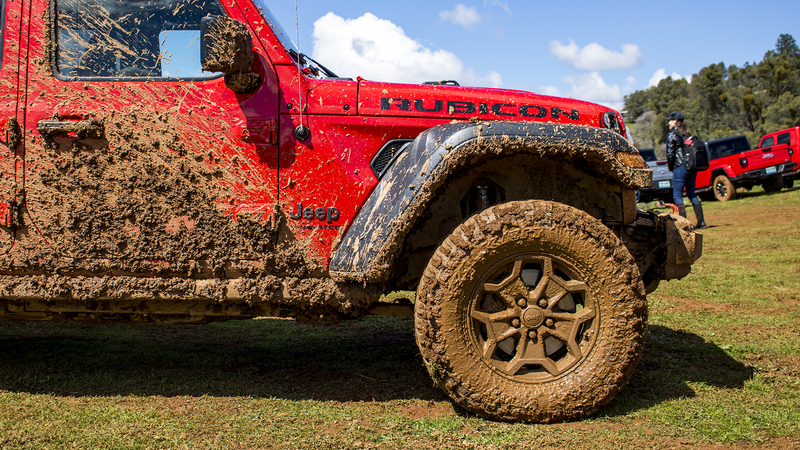 The Gladiator Rubicon's got a few other tricks. 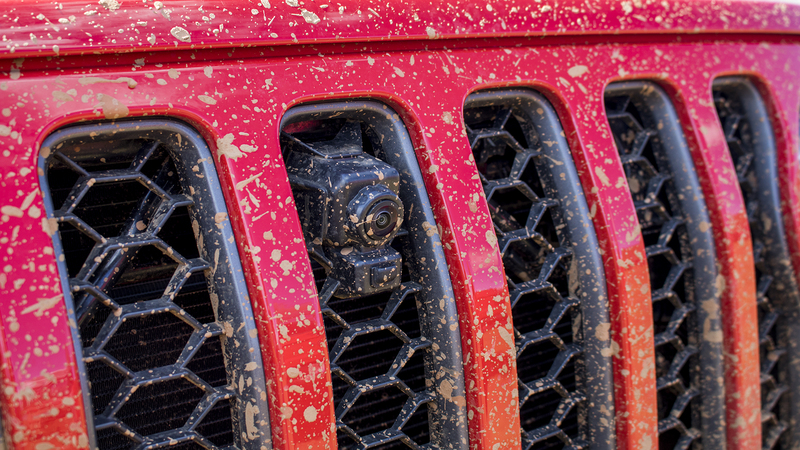 Some are novel for the brand in general, like a front-facing camera for seeing obstacles "through" the hood in low-speed situations that's equipped with an integrated washer for the inevitable mud bath. It's also got an Off-Road Plus mode that allows higher-speed driving with the rear differential locked—think sand dunes. 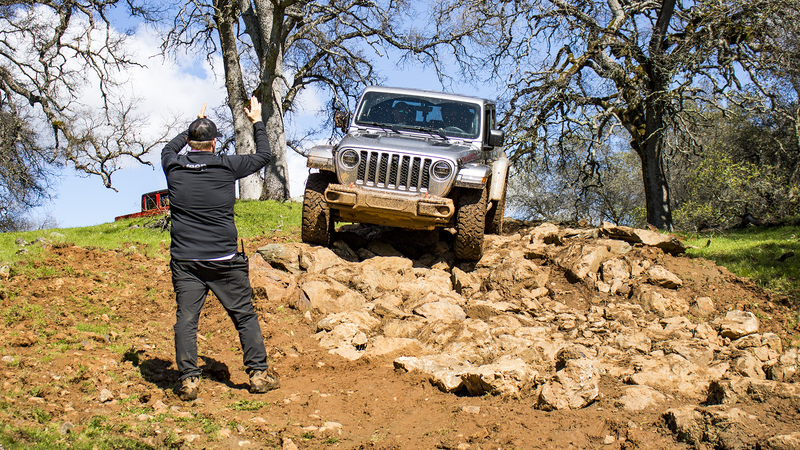 Others are borrowed from the Wrangler but never before seen on a pickup, like the electronic sway bar disconnect feature for increased articulation. But they all perform that potent magic, bewitching anyone lucky enough to spend an afternoon bashing someone else's truck down a rocky trail. We hit the provided off-road course during the media preview four times—you know, for science—growing more impressed with its deft nature. And Jeep deserves credit for setting up a test where you could seriously damage the truck and saying hey, have at it. Really, the only thing that will slow down the Jeep Gladiator are its base tires. The standard 31-inch Bridgestone all-seasons standard on the lesser models aren't well-suited for anything slick. Paradoxically, the forces that propelled the humble Jeep Wrangler to a record 240,000 sales last year have little to do with things like suspension geometry and skid plates. The Wrangler sells because it's a rolling anachronism wrapped in nostalgia inside a throwback. Think about it: It's fairly unbelievable that in 2019 you can buy an SUV that not only allows but encourages (via the included tool kit and built-in diagrams) you to remove the doors, top, and windshield before setting out for a cruise around town—now apply that to a pickup. The base Gladiator Sport comes with manual windows, cloth seats, a standard manual transmission, and the smallest possible infotainment screen that can still support the legally-mandated backup camera. You can quibble about whether its inherent Jeepness bridges the gap between its lack of comforts and that $34,000 starting price. But you can't deny that the 2020 Jeep Gladiator is one of a kind. America hasn't seen a droptop pickup since the Dodge Dakota Sport convertible bowed out in 1991, nor a solid front axle on anything smaller than a heavy-duty truck since 2001. Both aspects seem extremely out of step with the times from a market perspective, and yet that's exactly why combining them in a single unapologetic form works. The result is a characterful, interesting vehicle that seems completely at ease with what it's supposed to be: A Jeep truck. Not the perfect truck for everyone, not the truck of tomorrow, but just the best Jeep truck it could be in every sense of the word. 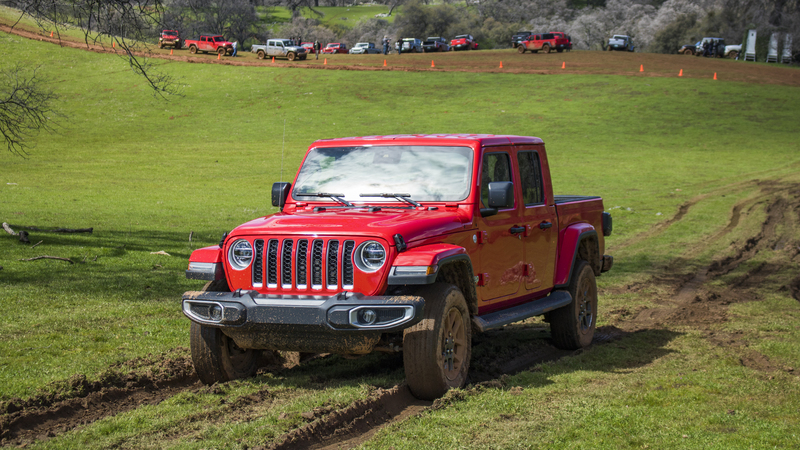 Focus yields greatness; the folly of a crossover trying to be halfway competent at everything and generate a modicum of emotion while doing so is immediately apparent when you slide behind the wheel of something like the Jeep Gladiator. Love it, hate it, but recognize the fact that it generates emotions in the way cars used to but distinctly do not anymore. 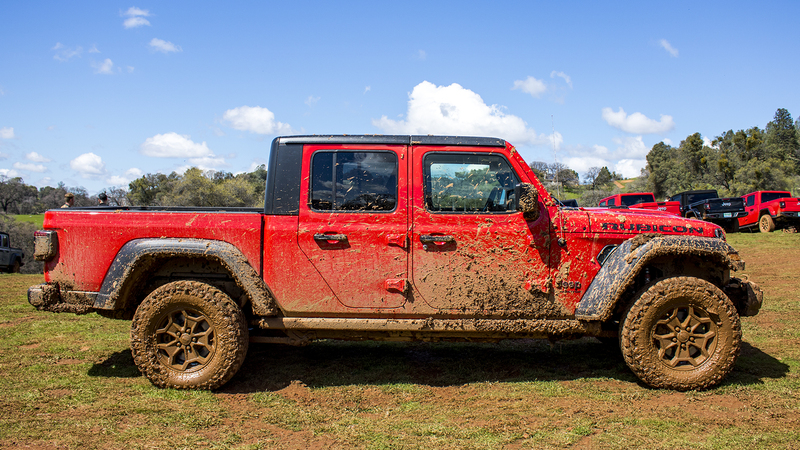 A key distinction between the Jeep Gladiator and the rest of the midsize crew is how new it is. Every other truck in the segment dates back at least 8 years, some having been introduced in foreign markets before being brought home to capitalize on this decade's truck craze. Updates are coming, but in the meantime the Jeep is the freshest kid on the block. Below are some brief headline stats showing how it stacks up against the competition. These figures are for the Gladiator Sport S with Max Towing and similarly-equipped gasoline V-6 crew cab trims of the others. It's fair that for some, the powerful emotion they'll feel gazing upon the 2020 Jeep Gladiator is sheer confusion. Why? What's the point? Anyone who wants a Jeep Wrangler can buy a Wrangler, and anyone who wants a pickup truck can buy one from the five or so companies that have sold one in America for decades. Combining them into a single vehicle is nifty but inherently silly exercise. Ultimately, though, such a view misses the forest for the trees. With Jeep selling more Wranglers in 2018 than entire brands like Audi, it's clear there's a market for something with its joyful indifference to modernity. As a natural outgrowth of that philosophy, the Jeep Gladiator doesn't have to make complete sense. It just has to nail its mark. And in doing so, the Gladiator actually makes quite a compelling argument for itself on both fronts. 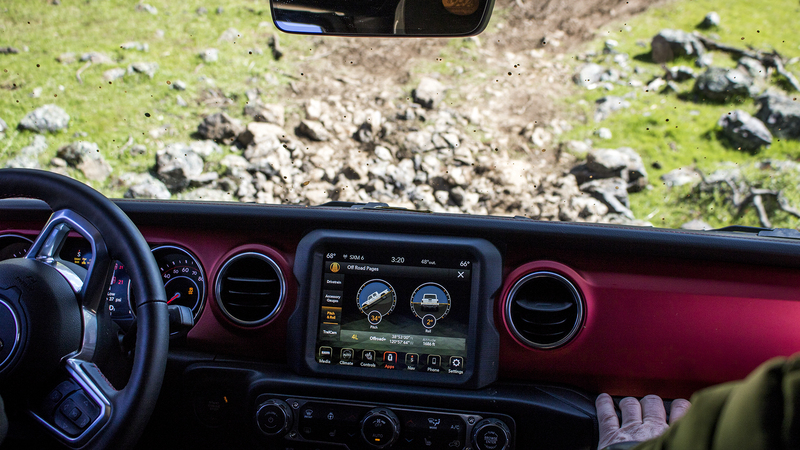 It's still enough of an off-road beast that anyone looking to buy a four-door Wrangler Unlimited would miss next-to-nothing in capability by considering the pickup. And it's enough of a pickup that it stands on its own in a crowded, competitive segment, besting rivals in hard targets like towing and softer considerations like seating position. But the Gladiator's ultimate victory can't be found on any kind of spec sheet. It's out there in the world, in the way it connects you to your surroundings better than any stupid phone, in the stage presence it has just sitting there, in the face you make clambering down a 40-degree slope. It's a machine with a soul.